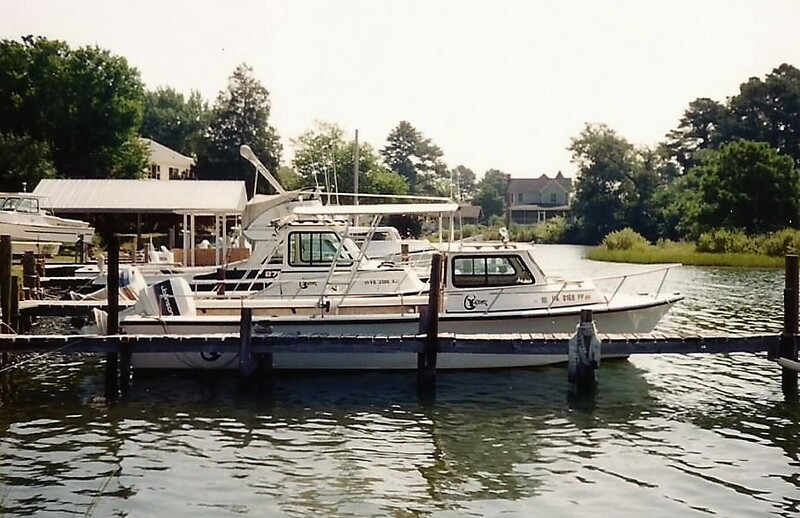 When I got my first boat I was living in a coastal Virginia community. I kept the boat in a rented slip on a small bay that ran behind the town. I used it primarily for fishing, and had to learn the “rules of the road” for safe boating. One of those had to do with controlling my boat’s wake. Every harbor has its “no wake” zone. 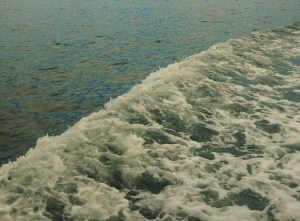 Even a small runabout like I had can churn up a wake that can capsize other boats. It occurs to me that we all leave a “wake” in our daily interactions with others. By the way we interact we may leave positive or negative feelings behind us. A large boat disregarding its wake when passing a smaller boat where people are fishing can interfere with their catch–or worse, capsize them. At the very least, it will cause feelings of anger or resentment. Respect for others in a no-wake zone or an area where a lot of small boats are fishing contributes the the enjoyment of all who are on the water. I think of another “wake” experience. The place was Caliboque Sound in South Carolina. I was on a ferry crossing from Hilton Head Island to Daufuskie Island. Seeing some excitement among passengers on the stern deck, I went back to see what was happening. It was exciting. There were dolphins playing in the wake of the boat. They would swim in close, then get caught in the churn of the wake and playfully surface and dive again. My faith teaches me that I am, as I used to phrase it in my ministry, a “unique creation of a good and loving God.” That’s a key part of our spiritual genetics. We are connected with our Creator by a cord of love. God creates us in love, with no strings attached, and his love seeks to redeem us when we get lost, disconnected, or confused. When we are hurt by others, or cause harm or suffering to someone, God’s love offers to set us back on a positive, fruitful path. It’s in the wake of God’s indescribable, unending love that I find my deepest needs fulfilled. God’s love restores my soul. Through his Son, who gave his life for me, I know there is always hope. My prayer is that I will leave marks of that love, and its impact on my life, in my “wake” as I journey through life. Back in the eighties, Stan Grayson and Lillie Plume were planning their wedding and a new life together at Dinkel Island. Both being artists, whey wanted a building suitable for studio space, a gallery and living quarters. Barb Reilly at Beach Realty found them just the right property. One particular feature stood out for Lillie. It had nothing to do with the building, quality of construction, appropriateness of layout. It was the presence of a large maple tree in the yard that created a homey touch. They bought the place in the spring, and by fall Lillie basked in the beauty of their backyard maple. Each year the progression of colorful change would be a little different, depending on weather conditions. What was constant was the symphonic melody of vibrant greens, yellows and reds the tree broadcast each October. The tree still stands. One day recently Stan took his lunch outside the studio and soaked up its colorful presence. He thought how it was a symbol of the incredible diversity God had put into creation. Sometimes that diversity produces painful experiences, imponderable circumstances and events. Sometimes it produces challenges that test us and make us stretch toward new levels of being. Sometimes it produces deep discoveries, rewards and satisfactions. As light and shadow played among the leaves and branches, Stan sensed a melodious solfege of moods. In the tree’s aura time seemed to pause. A continuum emerged within him so that what was past, what is current, and what is yet to be became joined in a unity with his Creator’s purpose. Stressful notes hammered in the background, setting the pulsebeat, while hope, joy, beauty, promise and peace wove their way into an uplifting treble cleft of anticipation. 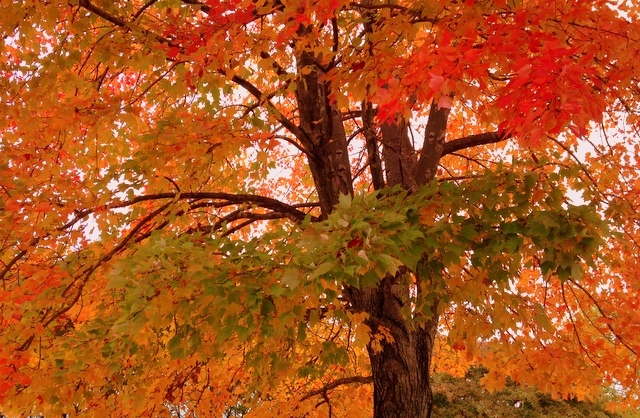 God is good, he thought, and his goodness always prevails–like the transcendent symphony of color in this maple tree. Maybe we all need to pause and let autumn trees share with us a symphony of color that transcends whatever wears us down in daily life. It’s a thought! 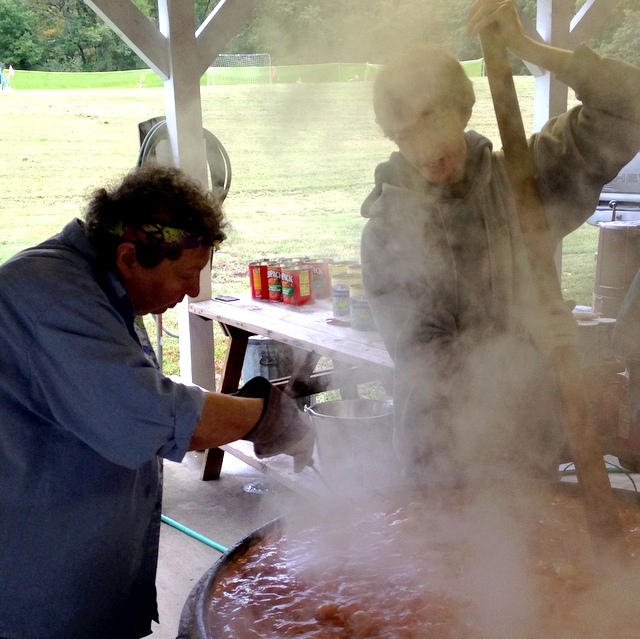 I arrived at the shelter behind Providence UM Church Saturday morning to help prepare brunswick stew for an annual fall event. I found three pots going and a bunch of very organized folks actively engaged in a variety of tasks. I pitched in taking turns stirring and scraping, just as we were beginning to cook potatoes and onions. Cans of additional ingredients were standing by on nearby tables, waiting to be added at the appropriate time. It was a long day of work for a lot of people that was worth every moment they spent doing it. As I worked, a number of “stew” sayings drifted through my mind. Things like “being in a stew”–getting into a state of worry or concern about someone or something. How easy it is to do that when we let anxiety overwhelm us. I thought of “stewing in one’s own juices”–being left alone to suffer the consequences of something, or to “stew” in anger or disappointment. If you’re like me, that happens to you from time to time. Sometimes we make unwise choices, or intentionally ignore what we know to be right or proper in some situation–and we pay the price. Another saying jumped into mind, “too many cooks spoil the stew.” Well, not this stew! That saying refers to times when a common effort gets spoiled because too many people try to manage things. Guess I’ve contributed to stuff like that sometimes, too. Haven’t you? Work flowed cooperatively, and by evening, a magnificent serving of stew awaited everyone who wanted to stop by for supper. 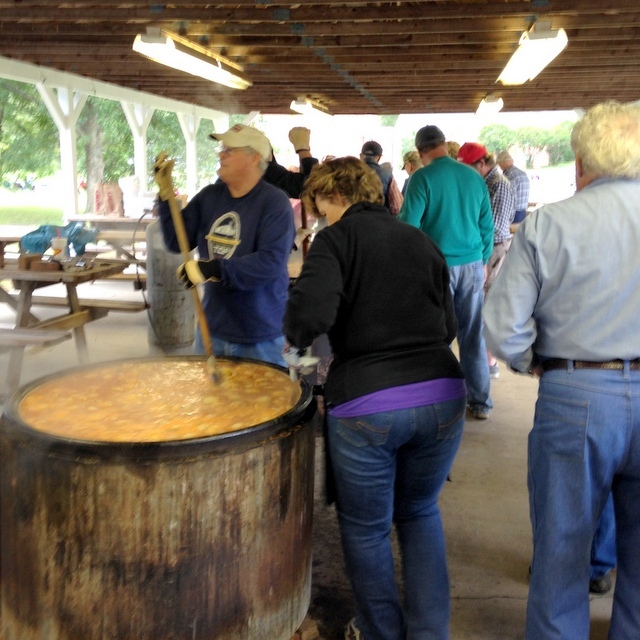 A parade of people donated to our ministry, buying quarts of stew to take home and enjoy later with family or friends. What a tiring, but magnificent day! I can think of a few times when I’ve found myself “in a stew.” But not so with this stew-cooking venture. This was refreshing. It felt good. Work, yes! Discipline, yes! Time, yes! Commitment, yes! Fulfillment, YES! Thanks to all who made it possible! Next year I want to do this again. Oh, and with God’s help, I want to do my part to make other ventures–especially those that involve complex issues or tasks–into positive times of refreshing goodness. Dinkel Island boaters began bringing their crafts farther up into Crabber’s Creek as an early October Nor’easter approached. Junior Hawkins had a sheltered area behind Pappy’s Place, but it was small. A few watermen got in there as soon as the storm warnings were posted. Everybody else left their slips on Tranquility Bay, made their way around the island, under the drawbridge and up into the small tributaries that lined the creek. The two men finished mooring the boat as securely as they could, then went up the planked walkway to the house. The wind was beginning to whip up the water where it pooled in the marsh grass. They were soaked and chilled by the time they reached the back deck. Cheryl met them at the door. Ed drew her close. “I don’t know. All we can do is trust God with this.” He held her tightly. The storm continued to build up, not a rapid surge that would move through quickly, but a slow, deliberate, vicious kind of event. That night after supper, the lights went out. Stan turned on the emergency generator which kept them safe and allowed enough light to function–and kept the food safe in the refrigerator and freezer. They gathered in the dining room, which was away from the windows and more toward the leeward side of the house. “Anybody for a game of Hand and Foot?” They all agreed and soon began to ignore the rain pounding against the windows, and wind whistling in the weatherstripping. By the end of the game, they were all tired. “Before we turn in, let’s have a prayer circle,” said Ed. They all gathered and felt the assurance of God’s presence. Soon they settled into a peaceful night’s sleep in spite of the storm outside. In the morning the storm continued to rage. It went on all day, finally showing signs of growing weaker by evening. The next day they all gathered at Bob and Cheryl’s place. The tidal surge had brought water all the way to the deck, but the house was not damaged. There were some loblolly pines down, and lots of debris in the yard. Just as Special–Maybe More So! Sharon and I had always planned to celebrate our thirtieth anniversary in Hilton Head at Hugo’s. We met Hugo when Fitzgerald’s Restaurant closed a few years ago. Hugo had been the head chef. He moved into a space at the Shops at Wexford. It was his practice to greet diners personally, and we developed a passing relationship. Each year when we visited the island we would reserve our best evening meal for Hugo’s. Times change. We stopped going to Hilton Head every year. We were there for our twenty-ninth anniversary, and chatted for a while with Hugo. We told him we’d be back the next year for our thirtieth anniversary. It didn’t happen. That would have been 2012, which was the time when Sharon’s neurological condition called normal pressure hydrocephalus (NPH) began to have a huge impact on our lives. Cerebrospinal fluid no longer fully absorbed and processed by her body began to pack into brain cavities. The results were increasing degrees of imbalance, difficulty walking, falls, memory loss, cognitive impairment, and incontinence. Sharon had a shunt surgically implanted in her brain in June of 2013. It was a joyful occasion toward which we had worked for many months. The shunt enabled the removal of pressures in her brain that had disabled her. 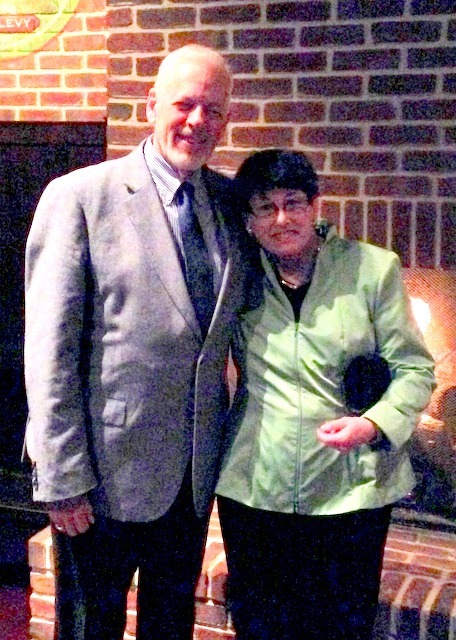 When we celebrated our thirty-second anniversary, Sharon was just out of the hospital and still in rehab. We didn’t even consider going to Hilton Head. The next year we visited a friend at a different time of year from our anniversary. This year we missed Hilton Head for our thirty-third anniversary. Then a few days ago Sharon made an announcement. “Surprise! I’m going to treat us to a special dinner at a restaurant where we’ve never been. I’ve been setting aside money for this, and I’l like for it to be a belated celebration of our thirtieth anniversary.” What a joyful occasion it was–one of the best evenings out we’ve had in years. It wasn’t Hilton Head, and it wasn’t Hugo’s, but it had that same kind of appeal to us. It was a celebration of God’s blessings in our life together. Who can explain the ups and down life involves? As a saying goes, both sunshine and rain fall on the just and unjust alike. Sometimes life-altering things happen, and all you can do is make adjustments. Frequently new joys and achievements flow from things we thought of as devastating when they occurred. If we are people of faith, the last word is never with us. It is always with God. Certainly that has been true in Sharon’s experience with NPH. It had cast her into a state of dementia, yet once the cause behind the condition was corrected, her functioning returned to normal. So impressed have we been with this healing that we wrote a small book together. It’s called NPH Journey into Dementia and Out Again, and it was published this year. With an estimate that five percent of persons thought to have Alzheimer’s Disease may actually have undiagnosed NPH, we have been moved to “get the word out.” From our book sales we send support to the educational and research efforts of the Hydrocephalus Association in Bethesda, Maryland. Every day we pray to be effective in helping someone who might have undiagnosed NPH to find help and hope. Frequently we hear from people who assure us these prayers are being answered. A few days ago, another prayer was answered. We were able to celebrate the thirtieth anniversary of our marriage in a special way we thought we’d missed! It wasn’t at Hugo’s, but it was just as special–maybe even more so!